When you choose to index permissions associated with Jira Software items, the Coveo connector needs a security provider. When permissions are indexed, in Coveo search results, a user searching for Jira Software content only sees the content to which he has access in Jira. Note: You can get familiar with how Coveo components deal with permissions on documents both at indexing and query time (see Security) . In the navigation panel on the left, click Security Providers. 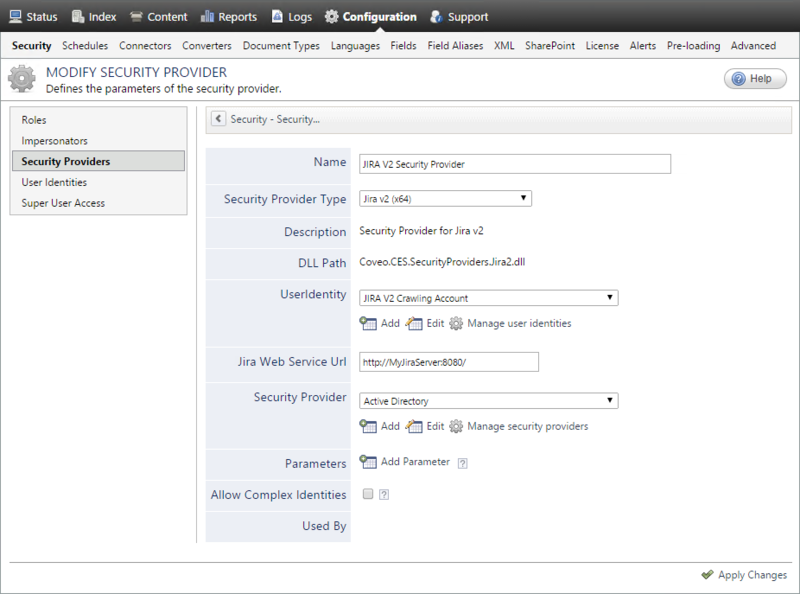 In the Security Providers page, click Add to create a new security provider. Choose a significant name to identify the security provider. Select the Jira Software V2 user identity that you created previously (see Atlassian Jira Software V2 Connector Deployment Overview) . When the Jira Software LDAP is synchronized with an Active Directory, select the out-of-the-box Active Directory security provider to map Jira Software users to AD users. CES 7.0.7814+ (August 2015) When an email is defined for all users in Jira Software and they are authenticated with this email when they perform a search in your CES search interface, select the Email security provider you previously created (see Atlassian Jira Software V2 Connector Deployment Overview). Note: CES 7.0.7711– (June 2015) If your Jira and AD user names do not match, contact Coveo Support for assistance with other methods to map users. CES 7.0.8541+ (September 2016) (Optional) Select the Expand 'any logged in user' Virtual Group check box when you want the any logged in user virtual group to contain all your Jira Software users. Inactive users are not expanded even when the option is selected. By default, the any logged in user virtual group only contains the Jira Software users seen by the Coveo security provider. Whether to use Kerberos authentication. The default value is false. Set it to true when crawling a Kerberos setup. The custom server principal name (SPN) to use with the Kerberos authentication. The SPN is almost always in the following format: HTTP/server.name@server.domain. If the domain name is not contained in the SPN, the connector uses the user domain, which may be wrong. Use this parameter when the crawling user identity used is not on the same domain as the Jira Software server. Example: You use user@domain.com as the user identity to crawl http://jira.dev.domain.com. This parameter is only used when the UseKerberosAuthentication parameter value is true. Make sure the user identity exists in both Jira Software and AD. The Kerberos Authentication failed for user 'userIdentity' with the SPN 'HTTP/ServerName'. it means the user identity and/or the SPN are wrong. Leave the Allow Complex Identities cleared as it does not apply to this type of security provider. Configure and index a Jira Software V2 source (see Configuring and Indexing an Atlassian Jira Software V2 Source).